Harry Chalk - Secret Agent is my latest animated short on GoAnimate and, although it looks fairly straight forward to regular GoAnimaters, there's a lot of behind the scenes tricks that newer GoA members might find useful in their own productions. So sit back and settle in. This article is probably going to be a long one! Mathew is your typical student who finds school boring and passes his time in class with an over active imagination. However sometimes the line between imagination and reality gets a little fuzzy - especially where Secret Agent, Harry Chalk is concerned. Believe it or not Harry Chalk started out as a planned GoAnimate tutorial on script writing/story development - hence the classroom setting. Whilst animating chalk stick figures on a blackboard is certainly not a new idea - I'm sure Warner Brother's and Disney have both done something similar at some point in their cartoons - it occurred to me that GoAnimate's stick figures are ideal for just that purpose. I thought it would be a great way to present a tutorial so I picked a school room background from GoAnimate's Classic theme added some stick figures and saved it all for a future date. As a fairly high profile GoAnimator I get a lot of members requesting me to watch their animations, many of which are stick figure fights or Street Fighter fights. Some are more successful than others but what many of them lack is a story or even a dialog between the fighters. They're just straight fights and they get boring after a while (why do you think the World Wrestling Entertainment includes all the characters and drama around all their fights?). When another project I was working on stalled I decided to start work on my stick figure tutorial. 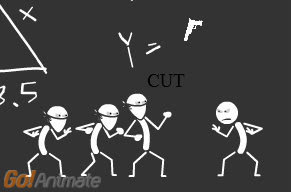 It wasn't long before I realized this was the perfect opportunity to try my own stick figure fight animation how I'd like to see them done. I like a fight to have a story and I like to know who the characters are. I don't write scripts for my animations. I just start with the bones of an idea and see where it takes me as I work. One thing I knew early on was that I wanted my stick figure characters to have fairly ordinary sounding names. Nothing heroic like 'Indianna Jones' or 'Buzz Lightyear'. Just common names like 'Harry', 'Bill' and 'Sally'. Their surnames came as I was nearly finished and all relate to blackboards in some way 'Harry Chalk', 'Bill Duster' and 'Sally White'. (Bill and Sally's surnames are not mentioned in the animation but are included in the animation's description on GoAnimate). Not wanting to do just a straight stick figure fight I decided if I could convincingly create an introduction of a bored student imagining the stick figures coming to life on a black board then the animation would go ahead. Then, when I got to the point of creating the fight, I let that just develop as the story on the blackboard unfolded. There would be no background to the characters - you learn about them through their dialog. Something that I've learned from using DomoAnimate and ToonCreator (two sites where you can't upload custom anything and both with limited background choices) is how to make the most of what you have. I'm constantly looking into existing backgrounds to see how I can 'redress' them to create new camera angles on the same scene. Technically Harry Chalk has two backgrounds. The school room and a single color dark grey background (used for close ups of the blackboard). However the school room background is redressed to create two camera angles of the same class room and the hallway outside the Principal's office. The images on the right show the original GoAnimate Cartoon Classic School room at the top and how I redressed the scene. I chose this particular background because, of the three black boards already available on GoAnimate, this one looked the best and is the only one that already has a pre-drawn lesson on it. To remove the blackboard, for the side view (image 2), all it took was an appropriately colored rectangle prop from the stick figure theme to hide it behind. Then, for the front of class blackboard view, I simply uncovered the blackboard, removed all the desks and then cropped the scene tightly (image 3). In this image you'll notice two students just off the edge of the crop lines so it looks like you can see the tops of the heads of the kids sitting in the front row. The room also works as the corridor outside the Principal's office because anyone who has ever been inside a school knows that most schools look pretty much the same internally no matter where you are. All it required was a bench seat, a name on the door and some tight cropping (image 4). The most important thing about an animated fight is timing. In GoAnimate that means making sure when one character is hit they react to that hit. It can be a little tricky to get this right as you have to allow individual pre-drawn character actions to flow across each frame of the scene. i.e. You might start a character punching in frame 1, then the character needs to be duplicated in frame 2 so it can continue the punch and so the character being punched can react during frame 2 at the right time. It's fiddly and you also have to adjust the length of each frame too but get it right and it looks great (even before you add sound effects). The feature move in Harry and Bill's fight is Harry's gun kick which came about because my original idea of a three way fight between Harry and the Parallel Triad just became too hard. I'd always intended for Harry to kick the gun as he does but in the first draft the gun goes flying then the three way fist fight commences. Choreographing a fight is hard enough without having to make tiny adjustments to frame length and rechecking timing, reviewing scenes over and over for every single hit again and again until it's just right. I couldn't keep track. (Harry Chalk had clocked over 60 of my own views before I made it public!). It then occurred to me I'd seen this kind of multiple fight many times before, mostly done badly and now I knew why. Recalling a scene from Indianna Jones (Raiders of the Lost Ark), where Indy just shoots an obviously skilled swordsman, I thought how cool would it look if Harry kicked the gun out of the first guys hand, caught it and then shot all three men? It seemed a simple enough idea but it required a stunt double for Harry to make it work. If you look at the image above of Harry and the Triad with the gun in the air, in that exact scene there is another Harry hidden behind a dark grey rectangle. This second Harry is kicking off the 'point gun' action so that in the next frame, when Harry catches the gun, the first Harry is deleted and the screen hiding the 'stunt' double is removed.revealing a Harry that has an arm already raised from his side pointing the gun. I actually use a lot more custom props than you might think in my animations. Unlike other GoAnimators I tend to make props to support effects rather than to bring in something new for my characters to use. There's an obvious custom prop mask around the blackboard so that when you first see Harry he can climb up, from behind the wall onto the blackboard. Not so obvious is the custom pistol I had to make because the actual pistol prop wouldn't shrink smaller than 20 pixels (a limitation of the GoAnimate Studio). I needed it smaller to be in scale with my characters so I took a screen shot of the pistol then put it on a larger transparent background - allowing me to shrink the gun its self to much smaller than 20 pixels. Another less obvious custom prop is the text on the blackboard. The close up blackboard scenes are created on a grey background that fills the whole studio stage. To get the geometry diagrams onto that background I used Pencil animator to trace the diagrams and then imported this file as a custom flash prop. This meant my close ups of these diagrams wouldn't pixelate. The lines would be as sharp as they are if you zoomed in on the original diagrams in the school room background. Note that I had to create the special close up blackboard background because trying to work close up directly onto the blackboard in the school room background was too limiting. To be in scale on the original board the characters were already shrunk to their absolute minimum (which you see in the wider shots that include the teacher). Adding speech balloons and the gun kick was next to impossible. I never planned to voice this animation but because it had so many sound effects it also demanded that the characters speak their lines. I didn't record the voice overs until the day I released the animation. This is why the characters have speech balloons AND speak their lines. (Plus someone once commented on GoAnimate's forums that keeping the speech balloons was useful for deaf people). Harry Chalk is my 63rd animation on GoAnimate. In all that time I've never voiced one of my own animations. For anyone who's ever watched my seriously tedious (but informative) Youtube videos about selling on ebay you'll know my speaking voice is very much a monotone. I know I can be a struggle to listen to because I'm not particularly expressive vocally (and I sometimes talk with a noticeable whistle on my S's that seems more pronounced when recorded). It's for all these reasons and more that I haven't done my own voice work. However, I felt I did a fair job on voicing Harry Chalk - better than expected actually. So if you're like me and a little self conscious about your voice here's a tip - do the voices last. Get your animation done, use speech balloons and time the balloons so that you have just enough time to read each one out loud before they disappear. Next play the animation and perform and record the voices by reading the speech balloons in the animation. Try to be expressive but don't over think it - you won't have time - just keep up with the animation. The reason for doing the voices this way is to stop you thinking about how your voice is sounding or whether it sounds good. For Harry Chalk I recorded three full takes of me voicing the whole animation and used the entire third take on the actual finished video. Harry Chalk is 2 minutes 30 seconds in length. Allowing time between takes I recorded all my voice work in under 15 minutes. If you do try your own voices and think they sound terrible keep this in mind - very few people like the sound of their own recorded voice when they first hear it (that sounds nothing like me syndrome). Get over it. Sorry but that is how you sound. Get used to it. Life will be easier once you embrace your voice and start developing it for character work. I know that's a bit rich coming from me but I have over 200 videos on Youtube with me talking so I'm not afraid to put my (much criticized) recorded voice or image into the public domain. It's character work that's new to me. It goes without saying you need a microphone. In terms of software Audacity is a popular Freeware choice for GoAnimators. Another option is free video editing software (such as Windows Movie Maker). Many of these programs allow you to record a narration of your voice and save it as a .WAV file. Personally I have some high end video editing software called MAGIX Movie Edit Pro (I have Version 10 but they're up to Version 15). This relatively inexpensive software is so much more than just a video editor. It includes real time audio affects such as tempo and pitch adjustments. i.e. you can play a voice looped over and over in real time, adjusting settings until it sounds just right before committing the effect. This is how I distorted my voice in Harry Chalk. Movie Edit Pro also comes with preset effects such as the echo effect I used on Matt's voice when he is thinking his dialog. Most of the effects I used on the voices you can do with Audacity. Where video editing software comes into its own is that it's really easy to cut up your complete narration into it's individual lines and shift them around on the video editors time line so they match your animations timeline in the GoAnimate studio. You can also play around with effects and distortions on the audio whilst you work. 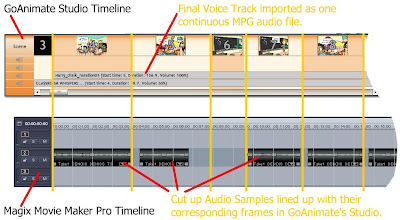 See the image below comparing GoAnimate's Studio timeline for Harry Chalk with Magix Movie Makers timeline. Once you've added all your effects and positioned each spoken line to match your animation exactly you just export the whole thing as one file that you then import into GoAnimate. IMPORTANT: Never upload your audio as a .WAV file. These tend to be too large and usually exceed GoAnimate's 8MB limit. For example Harry Chalk's entire voice track as a .WAV file was 22MB. Once I converted it to an MPG file it was just 2MB with no noticeable loss of quality. There are many free audio conversion software programs available - there's no real excuse for not converting your audio to an MPG file. In fact you can even use Audacity to convert your files. You can't always achieve everything you want with pre-animated characters. No matter how hard I tried I could not get Matt to convincingly throw the ball. He just doesn't have the right actions. If you watch closely the ball kind of floats around just before Matt throws it and it never really looks like it's in his hand. I'm sure I could've over come it with some custom work but instead I did the best I could and just kind of hoped the throw was over quickly enough for people not to be too concerned about how bad it actually looks. Harry Chalk demonstrates how you don't need much back story or even a lot of dialog to make a fight animation interesting. From the moment Bill and Harry start talking, the lines they speak tell you a little bit of information about them. Bill's first line, "You shouldn't have shown up here Harry." Already you know these two are rivals and one is named Harry. Harry's first line, "Where is she Bill?" Now you know both their names and that Harry is looking for a girl that Bill has hidden away somewhere. In two sentences I've given you everything you need to know about who these two are and why they're fighting. Is that really too much to ask of a fight video? Thanks Harshil. I kind of hope these behind the scenes posts are both interesting and helpful. They were very interesting and extremely helpful! Thanks for sharing all this TET. Some of I already knew or did, but I got some new ideas and tips as well. I'll be reading more of your blog and commenting accordingly. Wow, I mean all I can say is wow. I have to read this post ten times to make sure I get it all. I did not know it was this complicated. You are great. Thanks 94media. That's the trouble with GoAnimate... the finished result looks a lot easier than it actually is.